1. Place the oats, grated apple and berries in a bowl. Pour over the juice, mix well together then cover and chill overnight. 2. Divide between 6 small bowls and top with yogurt. Drizzle with honey and scatter over the chopped almonds. Serve with a glass of apple & mango juice. This will keep covered in the fridge for up to three days. 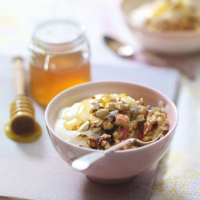 Try spicing up your bircher muesli with a little ground cinnamon. For a tropical twist on this recipe, swap the apple for chopped pineapple and sprinkle the top with grated coconut. This recipe was first published in Wed Jul 10 09:54:05 BST 2013.